This interview took place on: 2/21/11. Jesus freak Hideout (Timothy Estabrooks): What are you guys up to currently? Seth Hecox: "About 5 foot 10" is how my dad would answer that question. Because he was, uh, 5' 10". I, however, am much taller, so I can say 6' 2" and feel much better about myself. Other than be a wise-cracking smart aleck, though, I'm getting pumped on our new record Celestial Completion and all the exciting events associated with it. But I have a feeling that we'll talk about that in the coming questions, so I'll leave those words for later. JFH (Timothy): What are your upcoming tour plans, if any? Seth: We have some CD release shows. We have a headlining tour in April and May. We're looking into some other tours for the summer and, of course, some festivals. We love festivals and they're always fun. We had a busy year last year with a tour in South Africa and a trip to Mexico and a West Coast tour, so we'll be looking to do some of that again this year. We're currently booking a fall European tour. We'll probably hit the whole nation this year on one tour or another. I think it'll be fun! JFH (Timothy): How would you compare the writing and recording process for Celestial Completion to your other albums? Seth: It was more cohesive. We wrote the songs as a band at practice and played through them as we were writing them. It's more tedious but more rewarding. I like that. We got to really refine the songs before entering the studio and make each track the best we could and then work with our producer, Matt Goldman, to make sure everything was A+. JFH (Timothy): You guys have described this album as being very positive, even happy. Can you explain how you see that attitude meshing with the metal genre in general? Seth: Haha, well it's certainly not a common attitude among our metal peers. But it reflects who the members of BTA are and I think there's a place for it in heavy music. And we're not going overboard; it's not like we're holding flowers and singing about rainbows. The music is heavy and the lyrics are realistic and let's face it, optimism has a place in a realistic outlook as well as pessimism. JFH (Timothy): You brought in a lot of extra instrumentation and vocals for Celestial Completion. What was that process like in the recording studio? Seth: It was exhilarating. When you have this craving for sitar on your album and then you make it happen, it's very satisfying. When you want a huge epic intro track with horns and 5 layers of vocal lines, it's gratifying to actually pull it off well. We are so pleased with how everything came out. We rolled the dice on a lot of things, but while the sound is adventurous, it's well-done and not there just for the sake of trying to be different. All the unusual instruments and vocals felt right and we're confident they'll sound right to the listeners of the album. JFH (Timothy): I couldn't help but notice that your debut album, Terminate Damnation, was named after a classic Mortification song and featured album art by Dan Seagrave, while Celestial Completion is named after a classic Extol song and also has Dan Seagrave art. Are there other similarities between the two albums, or is that where the comparisons end? Seth: Well Jason, Duck and I are on both albums. And both albums were written live with the whole band contributing and refining each song before entering the studio. Other than that, though, they're pretty different. We're different people now than we were then and I think we're different in a good way. God has worked in our lives to bring us closer to Him and hopefully that's clear in the music and the lyrics. JFH (Timothy): Musically speaking, is Celestial Completion a nod back to the earlier days of Christian metal? Seth: No, not at all. Sorry all you traditional metal-heads. This is the music of the future, if I may be so bold. We are doing what we think will be huge here in a couple years and we're doing it the best we can. It's a kind of music that focuses on good songwriting, a huge sound from a production standpoint and a focus on beauty, whether that beauty is aggressive or experimental or reflective. JFH (Timothy): To follow up the last question, are there any bands or artists in particular that influenced you when you were writing this album? Seth: At this point, our influences have dwindled a great deal. We used to listen to all sorts of metal bands. Now I think we're incorporating our other music tastes and translating that into a heavy music context. We still listen to Mastodon and Opeth, but I think a lot of our best ideas come from outside of metal. We're all big Weird Al fans. Imagine how that sounds in a heavy setting :) I promise it's not as goofy as you're thinking. JFH (Timothy): What unique effects does new guitarist Daniel Gailey bring to this album? Seth: The awesome effect. He was a shot of energy and really helped make some things awesome on the album. His solos were great, his songwriting was strong and his vocals really spread the album out sonically. He has some high screams that fill out the aggressive vocals and then he and I sing together on all the clean vocal parts. JFH (Timothy): You have currently released one song from the album, titled “The Magnetic Sky,” and described it as the album’s single. Since metal albums generally don’t have singles, what was your approach on this track? Seth: Well, it was the best example of good songwriting that we had. It flows really well and always has melody, whether the melody is in the guitar lines or the vocals or the keyboard. That's something we try to do in every song and we pulled it off really well in "Magnetic Sky." Most people seem to like it and the ones who don't seem to understand that it's the "single" and aren't worried about anything. We have very understanding fans. JFH (Timothy): One more question: am I the only person who thinks it's awesome that Dennis Culp of Five Iron Frenzy is making an appearance on the album? Seth: Haha, no you're not. For one, we're all so excited that it worked out. We're all huge FIF fans. FIF still has a loyal following and we've gotten a lot of positive feedback about his guest trombone part even before people hear it. And get ready, that track is one that we'll release before the album comes out, so there'll be a whirlwind of discussion about it when it does hit the interwebs. JFH (Timothy): Thanks for the interview! Any final words for our readers? Seth: Yeah, no problem. Thanks for the cool questions! My final words are "Brush your teeth and do your homework. If you don't have any homework, get someone to assign you some, slacker." How's that? 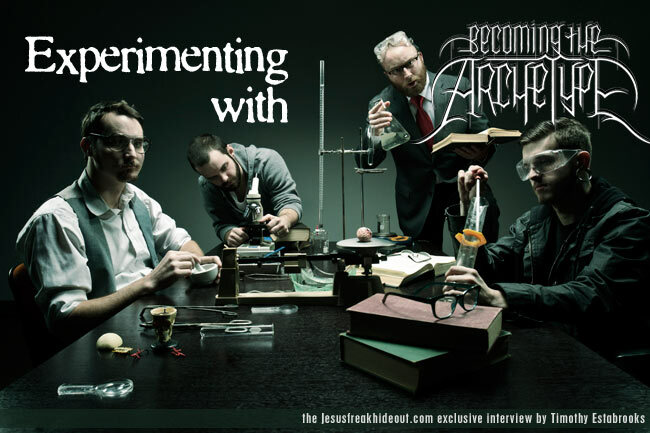 Becoming The Archetype's latest album, Celestial Completion, is in stores March 29!